Whether you’re a local shop owner or a business that services customers worldwide, having a website is no longer a luxury. It’s a necessity. Websites provide an online shopfront for businesses. A website that's well-designed can help you reach new customers and stand out from competitors. You have one chance to make a first impression. For those who haven’t heard of your business, your website will be a potential customer’s first touch point. A website with a strong design helps to strengthen your business’s overall image. A study by Stanford University uncovered that people quickly evaluate a site by visual design. If you can build a website that's built to highlight your credibility you'll easily set yourself apart from competitors. Quick tip: Testimonials, case study, badges, website security assurances are all elements of a website that creates trust and credibility. A good website alone won’t attract visitors if they don’t know your business exists. A well-designed website means more than just aesthetically pleasing design elements – it also means it is structurally designed to help clients find you on search engines. Mobile-friendly websites with good navigation and regularly updated content can work wonders to help your SEO, and ultimately drive conversions. The average time on site is around 15 seconds, which means your website needs to explain your product/service following quickly and effectively. A good website makes the most out of its homepage through text, imagery and oftentimes videos. This means visitors can quickly understand your business and what you can offer. Businesses can’t survive on loyal clients alone and attracting new prospects is essential to help your company grow. An effective website has a homepage that communicates your company’s value proposition, an 'about us' page and most importantly a 'contact us' form to collect potential leads. The pages required vary depending on your business but the idea is that your website has content that connects with your ideal client. A website should help generate sales and leads for you. It should have multiple ways for visitors to get in contact with you to find out more about your products and services such as through contact forms, calls to action and newsletter sign-ups. These leads are crucial to attracting new business. While digital marketing has grown rapidly in recent years, offline marketing is still essential to many businesses. 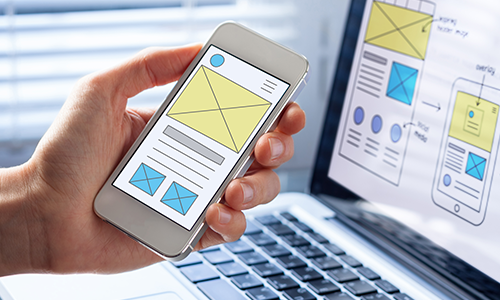 A well-designed website can complement all marketing efforts – both digital and offline – by giving you a place to direct prospects and clients. Investing in website design, both for branding purposes and SEO, can help increase traffic, and drive more sales. If you're ready to launch your website, get in touch with our team of online solutions advisors today.